Artificial Intelligence has become a hot topic in the recent past in Sri Lanka, with an eminent business personality explaining how his companies like Singer and HAYLEYS are using this technology to better serve the customers. Let me do a deep dive into this interesting area. In simple words, AI is a technology which making machines work in an intelligent way, similar to the way that of how a human mind works. The key benefits of AI is that machines do not take a break like humans. AI will keep working 24/7, 365 days, whilst AI can be developed to interpret human dictates, but it will not get stressed like humans do. Practice has proved that with AI, an organisation can minimise costs and increase efficiency. AI can be designed to do complex tasks which include thousands of variables, which the human mind will find it hard to do. The most important benefit of AI is that it can help human beings make better business decisions, but it cannot supersede the skills of a corporate leader, which is a point many forget. AI technology can be broken down broadly to three areas. Machine learning techniques, Applied Propensity models and AI applications. Typical machine learning techniques involve using algorithms to ‘learn’ from historical data sets, which leads to clubbing data and then predicting consumer behaviour. For instance, Applied Propensity models can be fed with data, and with the use of algorithms ‘discover’ what kind of attributes a typical customer looks for from a category. For instance, in the tea category, a typical customer will purchase a brand based on the drivers like quality of tea, type of tea, and flavours. On the other hand, a brand marketing company may be driving the market towards wanting a ‘Ceylon Tea’ or a ‘Single origin tea’, which the market might not actually be wanting (not in the consideration set of the buyer). This can then lead to predicting consumer behaviour. Such a study in the market place will take a minimum 3-4 months, whilst with the use of AI one can scan all the accessible data which is online, and then do this analysis for better decision making within just 4-5 days. In other words ‘Real Time Perceptions’ on a brand can be analysed using AI and there after predictive behaviour shared for better decision making on a brand. If one uses AI technology on Sri Lanka’s political landscape in the last three months, we see that typical drivers mentioned on the online discussions are dynamism of leadership, political savviness, international respect, being nationalistic, and economic growth. We can call this ‘discovered drivers’ in the political landscape of the country. 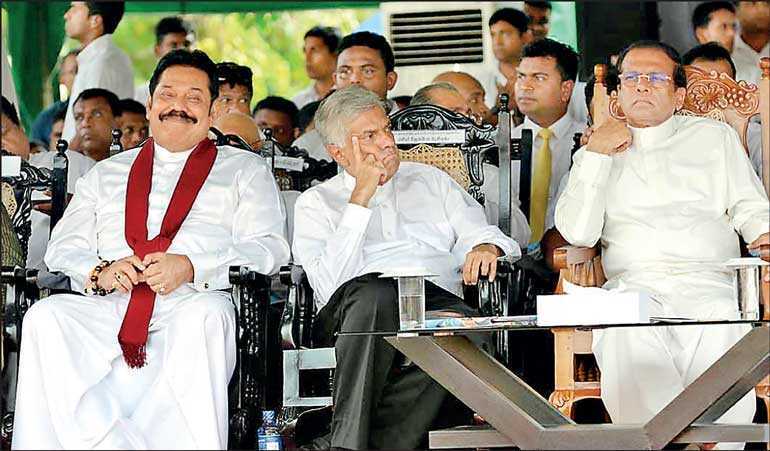 Based on a sample of 10,752 conversations online, we see the brand Mahinda Rajapaksa (MR) coming out stronger in relation to the other two brands, whilst on International Respect and Recognition attribute, the brand Ranil Wickramasinghe (RW) comes out ahead. Incidentally the brand Maithripala Sirisena (MS) is not getting traction on a particular attribute, which is a serious issue from a typical marketing perspective. With the above insights, in a typical political campaign one can convert insight about a customer and competitors, into a superior strategic position and plan that persuades voters to choose a specific candidate. But it has to fit with who the candidate is. When conceived and executed flawlessly, the result is more votes, and said person getting selected to high office. A classic example we saw was the famous campaign by former US President Barack Obama in his first term, and the campaign by Narendra Modi in India. The beauty about AI is that one can dig deeper and get consumer insights that statistical analyses like Google Analytics will not be able to do. For instance, using AI one can do a brand equity study on the above discovered drives, and pick up the surge and loss in the last 3 months. For instance, in the last 3 months, Brand MR has been surging ahead on the attributes ‘Dynamic Leadership’ whilst the other two brands has been losing ground, which means that if Brand MR was contesting for elections in the future, then we see the typical attributes that one must develop a campaign on. Namely, dynamic leadership, political savviness, good for the economy, and being nationalistic. If a deeper analysis is done, which attribute will give a stronger chance for ‘voter behaviour’ can be found out with a ‘predictive analysis’. Strangely, the brand MS scores high on ‘international respect/recognition’, which may be due to the recent overseas visits that he has made and the media mileage received. 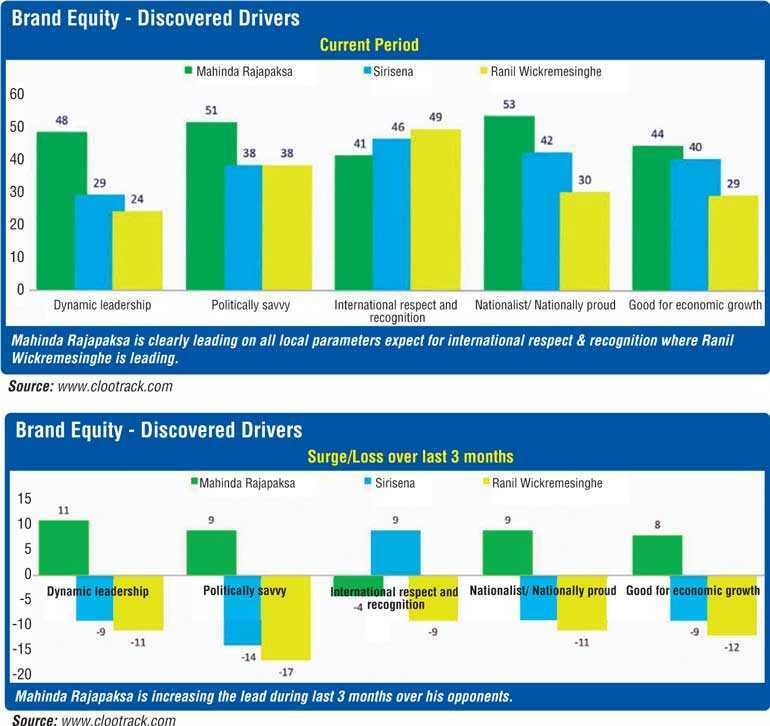 Another insight is that we see that Brand RW is not seen on this attribute on the media front, losing ground on the very attribute that he is strong on in the ‘discovered’ drivers. In essence we can summarise that the candidate who can effectively communicate how these needs can be addressed better by their overall solution, will garner support to be voted in at an election, which, incidentally, is marketing at its best. It would not be incorrect to say that it is the discipline of marketing that brings democracy into a system. This takes me to the next argument: if using AI for developing marketing strategy for a political candidate is right or wrong. In my view, using any tool that modern science gives to marketing a political candidate is the most democratic thing to do. The logic behind it being, first, that the product/service that is offered by a candidate must communicated effectively, in a manner so that the consumer is better informed on who best fits their requirement. Second, a typical politician is aware what a typical voter is looking for based on the issues faced in daily life. Where the use of AI and using such data for ‘marketing’ comes in for criticism is when marketing a candidate is done in a socially non-acceptable manner. This includes blocking of media by competitor political parties that are in power, below-the-line rivalry at meetings, voters not being allowed to vote, unlawful voting, etc., to name a few things which happen in many parts of Sri Lanka, just like in any other developing country. But a point to note is that this is not confined to political marketing, but happens across many consumer brands too, of which I have first-hand experience, which is an interesting parallel that many are not aware of. For instance, when a malted milk was launched once in Sri Lanka, the competitor bought up the key media belts on radio to block the new brand that was being launched, poached the competitor’s key employees, broke down the displays at the retail end, and pasted over the point of sale material, whilst adopting guerrilla tactics of promotions to undermine the competitor brand. Some even go to the extent of stalking the route plan of a sales representative’s itinerary, so that at the retail end you block retail space, which to my mind is somewhat similar to the marketing that is practiced during an election. The second point where marketing as a discipline draws flak when used in politics is when a candidate fails to deliver on the promise made after being elected. For instance, the collection of garbage daily, street lights not working, and even after complaining no action being taken to correct same, to name a few, when it comes to a Local Government Election. Then, marketing of a political candidate to high office can be considered unethical and wrong. Hence we see how AI can be used for marketing a political campaign. In fact, I can share how category drivers in Sri Lanka and brand drivers for Brands MS, RW and MR differ, whilst this can also be done on the emerging brands like Gotabaya Rajapaksa and Karu Jayasuriya. But the essence is that we see how ‘politics’ and ‘brands’ have many aspects in common, whilst it has its own industry-related peculiarities too. But at the end of the day, the winner is the consumer, and in this case the voter. Is it ethical? The debate will never stop!